Indicate by check mark whether the registrant is a large accelerated filer, an accelerated filer, a non‑accelerated filer, smaller reporting company, or an emerging growth company. See definitions of “large accelerated filer,” “accelerated filer,” “smaller reporting company,” and “emerging growth company” in Rule 12b‑2 of the Exchange Act. The aggregate market value of the ordinary shares held by non-affiliates of the registrant, computed as of June 30, 2017 (the last business day of the registrant’s most recently completed second quarter), was approximately $500,000,000. Unless the context otherwise requires, “we,” “us,” “our” and the “Company” refers to WillScot Corporation and its subsidiaries. Headquartered in Baltimore, Maryland, we are a market leader in the North America specialty rental services industry. We provide innovative modular space and portable storage solutions to diverse end markets utilizing a branch network of over 100 locations throughout the United States (“US”), Canada and Mexico. With roots dating back more than 60 years, we lease modular space and portable storage units (our “lease fleet”) to customers in the commercial and industrial, construction, education, energy and natural resources, government and other end-markets. We deliver “Ready to Work” solutions through our growing offering of value-added products and services (“VAPS”), such as the rental of steps, ramps, and furniture packages, damage waivers and other amenities. These turnkey solutions offer customers flexible, low-cost and timely solutions to meet their space needs on an outsourced basis. We complement our core leasing business by selling both new and used units, allowing us to leverage our scale, achieve purchasing benefits and redeploy capital employed in our lease fleet. WillScot Corporation (“WSC”), a Delaware corporation, is the holding company for the Williams Scotsman family of companies. All of our assets and operations are owned through Williams Scotsman Holdings Corp. (“WS Holdings”). We operate and own 90% of WS Holdings, and an affiliate of TDR Capital LLP (“TDR Capital”) owns the remaining 10%. Our Company (formerly known as Double Eagle Acquisition Corp.) was incorporated as a Cayman Islands exempted company in June 2015. We were incorporated as a special purpose acquisition company formed for the purpose of effecting a merger, capital stock exchange, asset acquisition, stock purchase, reorganization or other similar business combination with one or more target businesses. We completed an initial public offering in September 2015, after which our securities were listed on the Nasdaq Capital Market (“Nasdaq”). with proceeds from the Private Placement and the Notes offerings and borrowings under the ABL Facility, we indirectly acquired all of the issued and outstanding shares of common stock of WSII from affiliates of TDR Capital for an aggregate purchase price of $1.1 billion, of which (i) $1.0215 billion was payable in cash and (ii) $78.5 million was payable in shares of our Class B common stock, par value $0.0001 per share, representing a non-economic voting interest in the Company, and shares of WS Holdings common stock, which are exchangeable into shares of our Class A common stock. Upon completion of the Business Combination, the Nasdaq trading symbols of our Class A common stock and our warrants were changed to “WSC” and “WSCWW,” respectively. Although WSC was the indirect acquirer of WSII for legal purposes, the Business Combination was accounted for as a reverse acquisition in which WSII was treated as the accounting acquirer. Consequently, our financial statement presentation includes the financial statements of WSII and its subsidiaries as our predecessor for periods prior to the completion of the Business Combination and of WSC, including the consolidation of WSII and its subsidiaries, for periods from and after November 29, 2017, the closing date of the Business Combination. Prior to the completion of the Business Combination, a parent company of WSII’s former owners, Algeco Scotsman Global S.à r.l., (together with its subsidiaries, the “Algeco Group”), undertook an internal restructuring (the “Carve-Out Transaction”) whereby certain assets related to WSII’s historical Remote Accommodations Business were transferred from WSII to other entities owned by the Algeco Group. On December 20, 2017, WSII acquired 100% of the issued and outstanding ownership interests of Acton Mobile Resources Holdings LLC (“Acton Holdings”) for a cash purchase price of $237.1 million, subject to certain adjustments. Acton Holdings owns New Acton Mobile Industries LLC (“Acton”), which provides modular space and portable storage rental services from a branch network of 34 locations across the US. WSII funded the acquisition with cash on hand and borrowings under the ABL Facility. Results of operations from Acton subsequent to the acquisition on December 20, 2017 are included in our consolidated operating results. Lease fleet and all other assets acquired and liabilities assumed in the transaction are included in our balance sheet as of December 31, 2017. Panelized and Stackable Offices. Our AS FlexTM panelized and stackable offices are the next generation of modular space technology and offer maximum flexibility and design configurations. These units provide a modern, innovative design, smaller footprint, ground level access and interchangeable panels, including all glass panels, that allow customers to configure the space to their precise requirements. These units have the ability to expand upwards (up to three stories) and outwards. Single-Wide Modular Space Units. Single-wide modular space units include mobile offices and sales offices. These units offer maximum ease of installation and removal, and are deployed across the broadest range of applications in our fleet. These units typically have “open interiors” which can be modified using movable partitions, and include tile floors, air conditioning and heating units, partitions and, if requested, toilet facilities. Section Modulars and Redi-Plex. Section modulars are two or more units combined into one structure. Redi-Plex complexes offer advanced versatility for large, open floor plans or custom layouts with private offices. Redi-Plex is built with clearspan construction, which eliminates interference from support columns and allows for up to sixty feet of open building width and building lengths that increase in twelve foot increments, based on the number of units coupled together. Our proprietary design meets a wide range of national and state building, electrical, mechanical and plumbing codes, which creates versatility in fleet management. Examples of section modular units include hospital diagnostic annexes, special events headquarters, golf pro shops and larger general commercial offices. Classrooms. Classroom units are generally double-wide units adapted specifically for use by school systems or universities. Classroom units usually feature teaching aids, air conditioning/heating units, windows and, if requested, toilet facilities. Container Offices. Container offices are International Organization for Standardization (“ISO”) certified shipping containers that we convert for office use. They provide safe, secure, ground-level access with fully welded weather-resistant steel corrugated exteriors and exterior window guards made of welded steel and tamper-proof screws. Container offices are available in 20 and 40 foot lengths and in a combination of office and storage floor plans, or all-office floor plans. Other Modular Space. We offer a range of other specialty products that vary across regions and provide flexibility to serve demands for local markets. Examples include workforce accommodation units used to house workers with dining facilities often in remote locations, and toilet facilities to complement office and classroom units. Portable Storage. Storage units are typically ISO shipping containers with swing doors that are repurposed for commercial storage applications. These units are primarily ground-level entry, windowless storage containers made of heavy exterior metals for secure storage and water tightness. waiver program, we bill them for the cost of repairs above and beyond normal wear and tear. We provide delivery, site-work, installation, disassembly, unhooking and removal, and other services to our customers for an additional fee as part of our leasing and sales operations. Typically, units are placed on temporary foundations constructed by our in-house service technicians or subcontractors. These in-house service technicians or subcontractors also generally install any ancillary products and VAPS. Rental equipment leasing is our core business. Approximately 93% of new lease orders are on our standard lease agreement, pre-negotiated master lease or national account agreements. The initial lease periods vary, and our leases are customarily renewable on a month-to-month basis after their initial term. While the initial lease term is often relatively short, the average actual lease duration of our lease portfolio (including month-to-month renewals) is significantly longer. Currently, our average minimum lease terms at delivery for modular space units and portable storage units are 11 months and 7 months, respectively, while the average duration of our lease portfolio is 32 months, including those leases acquired as part of the Acton acquisition. Customers are responsible for the costs of delivery and set-up, dismantling and pick-up, customer-specified modifications, costs to return custom modifications back to standard configuration at end of lease and any loss or damage beyond normal wear and tear. Our leases generally require customers to maintain liability and property insurance covering the units during the lease term, and to indemnify us from losses caused by the negligence of the customer or their employees. As of December 31, 2017, we had over 75,000 modular space units and over 19,000 portable storage units, of which 53,275 of our modular space units, or 70%, and 14,234, or 72%, of our portable storage units were on rent. We complement our core leasing business with product sales. Generally, we purchase new units from a broad network of third-party manufacturers for sale. We typically do not purchase new units for resale until we have obtained firm purchase orders (which normally are non-cancelable and include up-front deposits) for such units. Buying units directly for resale adds scale to our purchasing, which is beneficial to overall supplier relationships and purchasing terms. New unit sales are a natural extension of our leasing operations in situations where customers have long-lived or permanent projects, making it more cost-effective to purchase rather than to lease a standard unit. In the normal course of managing our business, we also sell idle used rental units at fair market value and units that are already on rent if the customer expresses interest in owning, rather than continuing to rent the unit. The sale of units from our rental equipment has historically been both profitable and a cost-effective method to finance the replenishment and upgrade of the lease fleet, as well as generate free cash flow during periods of lower rental demand and utilization. Our sales business may include modifying or customizing units to meet customer requirements. We also offer delivery, installation and removal-related services for an additional fee as part of our sales operations. In 2017, we served over 35,000 customers. We believe that our customers prefer our modular space products over fixed, on-site built space because modular space products are a quick, flexible, cost-effective and risk-averse solution for expansion. Because modular space units are also built in controlled environments, they also offer higher quality than on-site builds. Customers in this category span a variety of industries ranging from commercial offices and warehouses; customers in entertainment, recreation, fast food and retail; transportation; recycling; chemicals and other manufacturing and industrial end-markets. We provide office and storage space to a broad array of contractors associated with non-residential buildings and non-building infrastructure. Our client portfolio includes many of the largest general contractors and engineering, procurement and construction companies in North America. Examples include highway, street, bridge and tunnel contractors; water, sewer, communication and power line contractors; and special construction trades, including glass, glazing and demolition. Our construction and infrastructure customer base is characterized by a wide variety of contractors that are associated with original construction as well as capital improvements in the private, institutional and municipal arenas. Rapid shifts in populations within regions often necessitate quick expansion of education facilities, particularly in elementary, secondary schools and universities and colleges. Regional and local governmental budgetary pressures, classroom size reduction legislation, refurbishment of existing facilities and the expansion of charter schools have made modular classrooms a convenient and cost-effective way to expand capacity in education settings. In addition, our products are used as classrooms when schools are undergoing large scale modernization, which allows continuous operation of a school while modernization progresses. Our products are leased to companies involved in up- mid- and down-stream oil and gas, electricity generation and transmission, mining exploration and extraction, forestry and other related sectors. Government customers consist of national, state, provincial and local public sector organizations. Modular space and portable storage solutions are particularly attractive to focused niches such as disaster relief, prisons and jails, courthouses, military installations, national security buildings and offices during building modernization. Our business primarily operates within the modular space and portable storage markets, however our services span across a variety of related sectors, including furniture rental, transportation and logistics, facilities rental services and commercial real estate. The modular space market is highly fragmented. Modular space units are non-residential structures designed to meet federal, provincial, state and local building codes and, in most cases, are designed to be relocatable. Modular space units are constructed offsite, utilizing manufacturing techniques to prefabricate single or multi-story whole building solutions in deliverable modular sections. Units are typically constructed of steel, wood and conventional building materials. Growing need and demand for space - driven by general economic activity, including gross domestic product growth, industrial production, mining and natural resources activity, non-residential construction, urbanization, public and education spending, and the scale and frequency of special events. Quick to install - the pre-fabrication of modular space units allows them to be put in place rapidly, providing potential long-term solutions to needs that may have materialized quickly. Flexibility - flexible assembly design allows modular space units to be built to suit a customer’s needs while offering customers the ability to adjust their space as their needs change. Cost effectiveness - modular space units provide a cost effective solution for temporary and permanent space requirements and allow customers to improve returns on capital in their core business. Quality - the pre-fabrication of modular space units is based on a repeatable process in a controlled environment, resulting in more consistent quality. Mobility - modular space units can easily be disassembled, transported to a new location and re-assembled. Environmentally friendly - relocatable buildings promote the reuse of facilities, on an as-needed basis by the occupants. The portable storage market is highly fragmented and remains primarily local in nature. Portable storage provides customers with a flexible and low-cost storage alternative to permanent warehouse space and fixed-site self-storage. In addition, portable storage addresses the need for security while providing for convenience and immediate accessibility to customers. focus historically in the modular space market. We believe that this broad service capability differentiates us from other rental and business services providers and clearly differentiates us in the marketplace. Although demand from certain of our customers is seasonal, our operations as a whole are not impacted in any material respect by seasonality. Our broad customer base, as well as the diverse end uses of our units by our customers, reduces the risk of seasonal business implications. No customer accounted for more than 4% of revenues for the year ended December 31, 2017. We have developed our market position by leveraging our extensive branch network, diverse fleet, technical expertise, operational capabilities and strong brand awareness among our customers. Our extensive scale allows us to attract and retain talent, and implement industry leading technology tools and process. This results in significant operational benefits, such as optimization of fleet yield and utilization, efficient capital allocation and superior service capabilities. We have established strong relationships with a diverse customer base, ranging from large national accounts to small local businesses. Our customers operate in multiple end-markets, including commercial and industrial, construction, education, energy and natural resources and government, among others. We believe that the diversity of our customer end-markets reduces our exposure to changes related to a given customer, shifts within an industry or geographic region, and end-market industry seasonality, while also providing significant opportunities to grow the business. Since geographic proximity to customers is a competitive advantage in the industry, we maintain a network of over 100 branches and additional drop lots to better service our customers. Our branches typically have a sales staff dedicated to the local market, with transportation personnel responsible for delivery and pick-up of our units and yard personnel responsible for loading and unloading units and performing modifications, repairs and maintenance. Customers benefit from improved service and response times, reduced time to occupancy, better access to sales representatives and lower freight costs, which are typically paid by the customer. We benefit because we are able to spread regional overhead and marketing costs over a larger lease base, redeploy units within our branch network to optimize utilization, enhance our competitive position by providing ample local supply and offer profitable short-term leases which would either not be profitable or would be cost prohibitive to the customer without a local market presence. We believe that the geographic diversity of our branch network reduces our exposure to changes related to a given region, while presenting us with significant growth opportunities. The following chart illustrates the breakdown of our customers and revenue by end markets as of December 31, 2017. We have made significant investments in our lease fleet. As of December 31, 2017, including the assets acquired as part of the Acton acquisition, our modular space and portable storage lease fleet consists of more than 45.0 million square feet of re-locatable space, comprising approximately 95,000 units with a gross book value of approximately $1.4 billion. The average age of our lease fleet is approximately 14.3 years, while the economic life can exceed 20 years. Our standardized lease fleet meets multi-state industrial building codes, which allows us to leverage our branch network and rapidly redeploy units to areas of higher customer demand in the surrounding geographic markets, as well as easily modify our structures to meet specific customer needs. Additionally, we have the flexibility to refurbish existing units in order to re-lease them when we have sufficient customer demand or we can choose to sell used units to customers. The relative simplicity and favorable condition and quality of the lease fleet, as well as our sourcing strategy where we source our units with no significant dependence on any one particular supplier and have no long-term purchase contracts with manufacturers, provides purchasing flexibility and allows us to adjust such expenditures based on our business needs and prevailing economic conditions. Further, we supplement our fleet spending with acquisitions, and consider our acquisition strategy to be opportunistic. We will adjust fleet spending patterns as acquisition opportunities become available. 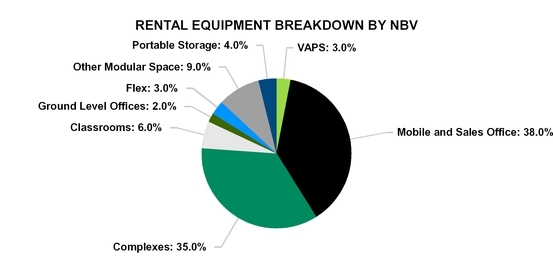 The following chart illustrates the breakdown of the net book value of our rental equipment between the various modular space product types, portable storage and VAPS as of December 31, 2017. 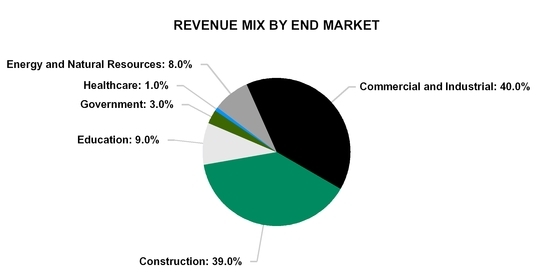 The majority of our revenues are generated through our core leasing business in the US. However, our core leasing business is complemented by unit sales. Our business consists of two reportable segments: Modular - US, comprised of the contiguous 48 states and Hawaii (“Modular - US”), and Modular - Other North America, comprised of Alaska, Canada and Mexico (“Modular - Other North America”). Corporate and other includes eliminations of costs and revenue between segments and the costs of certain corporate functions not directly attributable to the underlying segments. Although our competition varies significantly by local market, the modular space and portable storage industry is highly competitive and fragmented as a whole. We believe that participants in our industry compete on the basis of customer relationships, price, service, delivery speed, breadth and quality of equipment and additional services offered. We typically compete with one or more local providers in all of our markets, as well as with a limited number of national and regional companies. Some of our competitors may have greater market share in certain geographic regions. Significant modular space and portable storage competitors include Modspace, Inc., Mobile Mini, Mobile Modular, Pac-Van and ATCO Structures & Logistics. Numerous other regional and local companies compete in individual markets. As of December 31, 2017, we had over 1,600 employees and had collective bargaining agreements with approximately 2% of our employees. Approximately 88% of our employees are in the field, while 12% serve in corporate functions. We have not experienced a strike or significant work stoppage, and we consider our relations with employees to be good. We own a number of trademarks, none of which are individually material to our business. Our trademarks are registered or pending applications for registrations in the US Patent and Trademark Office and various non-US jurisdictions. We operate primarily under the Williams Scotsman brand. We are subject to certain environmental, transportation, anti-corruption, import controls, health and safety and other laws and regulations in countries, states or provinces, and localities in which we operate. The business incurs significant costs to comply with these laws and regulations. However, from time to time we may be subject to additional costs and penalties as a result of non-compliance. The discovery of currently unknown matters or conditions, new laws and regulations or different enforcement or interpretation of existing laws and regulations could materially harm our business or operations in the future. we believe that any environmental matters relating to us of which we are currently aware will not be material to our overall business or financial condition. The jurisdictions in which we operate are also subject to anti-bribery laws and regulations, such as the US Foreign Corrupt Practices Act of 1977, as amended (the “FCPA”). These regulations prevent companies and their officers, employees and agents from making payments to officials and public entities of foreign countries to facilitate obtaining new contracts. Violations of these laws and regulations may result in criminal sanctions and significant monetary penalties. A portion of our units are subject to regulation in certain states under motor vehicle and similar registrations and certificate of title statutes. Management believes that we have complied, in all material respects, with all motor vehicle registration and similar certificate of title statutes in states where such statutes clearly apply to modular space units. We have not taken actions under such statutes in states where we have determined that such statutes do not apply to modular space units. However, in certain states, the applicability of such statutes to modular space units is not clear beyond doubt. If additional registration and related requirements are deemed to be necessary in such states or if the laws in such states or other states were to change to require us to comply with such requirements, we could be subject to additional costs, fees and taxes as well as administrative burdens in order to comply with such statutes and requirements. Management does not believe that the effect of such compliance will be material to our business and financial condition. Our website address is www.willscot.com. We make available, free of charge through our website, our Annual Report on Form 10-K, Quarterly Reports on Form 10-Q, Current Reports on Form 8-K and amendments to those reports filed or furnished pursuant to Section 13(a) or 15(d) of the Securities Exchange Act of 1934 (the “Exchange Act”) as soon as reasonably practicable after such documents are electronically filed with, or furnished to, the United States Securities and Exchange Commission (the “SEC”). The SEC maintains an internet website at www.sec.gov that contains reports, proxy and information statements and other information regarding WSC. We face significant competition in the modular space and portable storage unit industry. If we are unable to compete successfully, we could lose customers and our revenue and profitability could decline. Although our competition varies significantly by market, the modular space and portable storage unit industry, in general, is highly competitive. We compete on the basis of a number of factors, including equipment availability, quality, price, service, reliability, appearance, functionality and delivery terms. We may experience pricing pressures in our operations in the future as some of our competitors seek to obtain market share by reducing prices. We may also face reduced demand for our products and services if our competitors are able to provide new or innovative products or services that better appeal to our potential customers. In each of our current markets, we face competition from national, regional and local companies who have an established market position in the specific service area. We expect to encounter similar competition in any new markets that we may enter. Some of our competitors may have greater market share, less indebtedness, greater pricing flexibility, more attractive product or service offerings or superior marketing and financial resources. Increased competition could result in lower profit margins, substantial pricing pressure and reduced market share. Price competition, together with other forms of competition, may materially adversely affect our business, results of operations and financial condition. Our operations are exposed to operational, economic, political and regulatory risks. reduced protection for intellectual property in some countries. These and other risks could have a material adverse effect on our business, results of operations and financial condition. Global or local economic movements could have a material adverse effect on our business. takes to receive customer payments. If we are not able to adjust our business in a timely and effective manner to changing economic conditions, our business, results of operations and financial condition may be materially adversely affected. Effective management of our rental equipment is vital to our business, and our failure to properly design, manufacture, repair and maintain our rental equipment could harm our business and reduce our operating results and cash flows. Our rental equipment has a long economic life and managing this rental equipment is a critical element to our lease business. Rental equipment asset management requires designing and building the product for a long life that anticipates the needs of our customers and changes in legislation, regulations, building codes and local permitting in the various markets in which we operate. In addition, we must successfully maintain and repair this rental equipment cost-effectively to maximize the economic life of the products and the proceeds received from the sale of such products. As the needs of our customers change, we may need to incur costs to relocate or retrofit our lease assets to better meet shifts in demand. If the distribution of our lease assets is not aligned with regional demand, we may be unable to take advantage of sales and lease opportunities despite excess inventory in other regions. If we are not able to successfully manage our lease assets, our business, results of operations and financial condition may be materially adversely affected. If we do not appropriately manage the design, manufacture, repair and maintenance of our rental equipment, or if we delay or defer such repair or maintenance or suffer unexpected losses of rental equipment due to theft or obsolescence, we may be required to incur impairment charges for equipment that is beyond economic repair or incur significant capital expenditures to acquire new rental equipment to serve demand. These failures may also result in personal injury or property damage claims, including claims based on poor indoor air quality and termination of leases or contracts by customers. Costs of contract performance, potential litigation and profits lost from termination could materially adversely affect our future operating results and cash flows. We may not be able to successfully acquire and integrate new operations, which could cause our business to suffer. 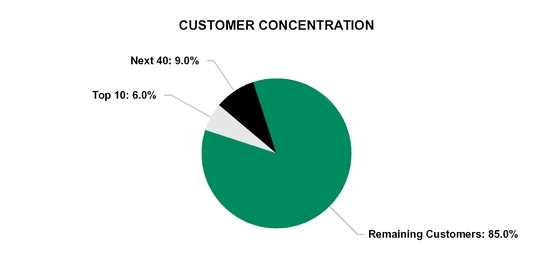 potential loss of key customers or employees. In connection with acquisitions we may assume liabilities or acquire damaged assets, some of which may be unknown at the time of such acquisitions. The condition and regulatory certification of any lease fleet acquired is assessed as part of the acquisition due diligence. In some cases, lease fleet condition or regulatory certification may be difficult to determine due to fleet being on lease at the time of acquisition and/or inadequate certification records. Lease fleet acquisitions may therefore result in a rectification cost which may not have been factored into the acquisition price, impacting deployability and ultimate profitability of the lease fleet acquired. Acquisitions are inherently risky, and no assurance can be given that our future acquisitions will be successful or will not materially adversely affect our business, results of operations and financial condition. If we do not manage new markets effectively, some of our new branches and acquisitions may lose money or fail, and we may have to close unprofitable branches. Closing a branch in such circumstances would likely result in additional expenses that would cause our operating results to suffer. To successfully manage growth, we will need to continue to identify additional qualified managers and employees to integrate acquisitions within our established operating, financial and other internal procedures and controls. We will also need to effectively motivate, train and manage our employees. Failure to successfully integrate recent and future acquisitions and new branches into existing operations could materially adversely affect our results of operations and financial condition. Changes in state building codes could adversely impact our ability to remarket our buildings, which would have a material impact on our business, financial condition and results of operations. Building codes are generally reviewed, debated and, in certain cases, modified on a national level every three years as an ongoing effort to keep the regulations current and improve the life, safety and welfare of the building’s occupants. All aspects of a given code are subject to change, including, but not limited to, such items as structural specifications for earthquake safety, energy efficiency and environmental standards, fire and life safety, transportation, lighting and noise limits. On occasion, state agencies have undertaken studies of indoor air quality and noise levels with a focus on permanent and modular classrooms. This process leads to a systematic change that requires engagement in the process and recognition that past methods will not always be accepted. New modular construction is very similar to conventional construction where newer codes and regulations generally increase cost. New governmental regulations may increase our acquisition costs of new rental equipment, as well as increase our costs to refurbish existing equipment. Compliance with building codes and regulations entails risk as state and local government authorities do not necessarily interpret building codes and regulations in a consistent manner, particularly where applicable regulations may be unclear and subject to interpretation. These regulations often provide broad discretion to governmental authorities that oversee these matters, which can result in unanticipated delays or increases in the cost of compliance in particular markets. The construction and modular industries have developed many “best practices” which are constantly evolving. Some of our peers and competitors may adopt practices that are more or less stringent than ours. When, and if, regulatory standards are clarified, the effect of the clarification may be to impose rules on our business and practices retroactively, at which time, we may not be in compliance with such regulations and we may be required to incur costly remediation. If we are unable to pass these increased costs on to our customers, our business, financial condition, operating cash flows and results of operations could be negatively impacted. If we do not effectively manage our credit risk, collect on our accounts receivable, or recover our rental equipment from our customers’ sites, it could have a material adverse effect on our business, financial condition and results of operations. We perform credit evaluation procedures on our customers on each transaction and require security deposits or other forms of security from our customers when a significant credit risk is identified. Failure to manage our credit risk and receive timely payments on our customer accounts receivable may result in the write-off of customer receivables and loss of units if we are unable to recover our rental equipment from our customers’ sites. If we are not able to manage credit risk, or if a large number of customers should have financial difficulties at the same time, our credit and rental equipment losses would increase above historical levels. If this should occur, our business, financial condition and results of operations may be materially and adversely affected. Our ability to use our net operating loss carryforwards and other tax attributes may be limited. As of December 31, 2017, we had US net operating loss (“NOL”) carryforwards of approximately $269.9 million for US federal income tax and state tax purposes available to offset future taxable income, prior to consideration of annual limitations that may be imposed under Section 382 (“Section 382”) of the Internal Revenue Code of 1986, as amended (the “Code”). The US NOL carryforwards begin to expire in 2028 if not utilized. In addition, we had foreign NOLs of $9.9 million as a result of our operations in Mexico. The Company’s Mexico NOL carryforwards begin to expire in 2020 if not utilized. Our US NOL and tax credit carryforwards could expire unused and be unavailable to offset future income tax liabilities. Under Section 382 and corresponding provisions of US state law, if a corporation undergoes an “ownership change,” generally defined as a greater than 50% change, by value, in its equity ownership over a three-year period, the corporation’s ability to use its pre-change US NOLs and other applicable pre-change tax attributes, such as research and development tax credits, to offset its post-change income may be limited. We have not completed a Section 382 analysis and therefore cannot forecast or otherwise determine our ability to derive any benefit from our various federal or state tax attribute carryforwards at this time. As a result, if we earn net taxable income, our ability to use our pre-change US NOL carryforwards to offset US federal taxable income may be subject to limitations, which could potentially result in increased future tax liability to us. In addition, at the state level, there may be periods during which the use of US NOLs is suspended or otherwise limited, which could accelerate or permanently increase state taxes owed. Lastly, we may experience ownership changes in the future as a result of subsequent shifts in our stock ownership, including the offering of the Notes, some of which may be outside of our control. If we determine that an ownership change has occurred and our ability to use our historical NOL and tax credit carryforwards is materially limited, it may result in increased future tax obligations. We may be unable to recognize deferred tax assets such as those related to our tax loss carryforwards and, as a result, lose future tax savings, which could have a negative impact on our liquidity and financial position. not previously deductible as incurred but may become deductible in the future subject to certain limitations. We may have to write down, via a valuation allowance, the carrying amount of certain of the deferred tax assets to the extent we determine it is not probable such deferred tax assets will continue to be recognized. Some of the tax loss carryforwards expire and if we do not have sufficient taxable income in future years to use the tax benefits before they expire, the benefit may be permanently lost. In addition, the taxing authorities could challenge our calculation of the amount of our tax attributes, which could reduce certain of our recognized tax benefits. In addition, tax laws in certain jurisdictions may limit the ability to use carryforwards upon a change in control. Unanticipated changes in our tax obligations, the adoption of a new tax legislation, or exposure to additional income tax liabilities could affect profitability. We are subject to income taxes in the United States, Canada and Mexico. Our tax liabilities are affected by the amounts charged for inventory, services, funding and other intercompany transactions. We are subject to potential tax examinations in these jurisdictions. Tax authorities may disagree with our intercompany charges, cross-jurisdictional transfer pricing or other tax positions and assess additional taxes. We regularly assess the likely outcomes of these examinations in order to determine the appropriateness of our tax provision. However, there can be no assurance that we will accurately predict the outcomes of these potential examinations, and the amounts ultimately paid upon resolution of examinations could be materially different from the amounts previously included in our income tax provision and, therefore, could have a material impact on our results of operations and cash flows. In addition, our future effective tax rate could be adversely affected by changes to our operating structure, changes in the mix of earnings in countries with differing statutory tax rates, changes in the valuation of deferred tax assets and liabilities, changes in tax laws and the discovery of new information in the course of our tax return preparation process. A number of proposals for broad reform of the corporate tax system in the US are under evaluation at the federal level, but it is not possible to accurately determine the overall impact of such proposals on our effective tax rate at this time. Changes in tax laws or regulations, including multijurisdictional changes enacted in response to the guidelines provided by the Organization for Economic Co-operation and Development to address base erosion and profit sharing, may increase tax uncertainty and adversely affect our results of operations. Our operations face foreign currency exchange rate exposure, which may materially adversely affect our business, results of operations and financial condition. Our revenues, results of operations and cash flows may also be materially and adversely affected by fluctuations in interest rates and commodity prices, including crude oil. We hold assets, incur liabilities, earn revenue and pay expenses in certain currencies other than the US dollar, primarily the Canadian dollar and the Mexican peso. Our consolidated financial results are denominated in US dollars and therefore, during times of a strengthening US dollar, our reported revenue in non-US dollar jurisdictions will be reduced because the local currency will translate into fewer US dollars. Revenue and expenses are translated into US dollars at the average exchange rate for the period. In addition, the assets and liabilities of our non-US dollar subsidiaries are translated into US dollars at the exchange rates in effect on the balance sheet date. Foreign currency exchange adjustments arising from certain intra-company obligations with and between our domestic companies and our foreign subsidiaries are marked-to-market and recorded as a non-cash loss or gain in each of our financial periods in our consolidated statements of operations. Accordingly, changes in currency exchange rates will cause our foreign currency adjustment in the consolidated statements of comprehensive loss to fluctuate. In addition, fluctuations in foreign currency exchange rates will impact the amount of US dollars we receive when we repatriate funds from our non-US dollar operations. Our borrowings under the ABL Facility are variable rate debt. Fluctuations in interest rates may negatively impact the amount of interest payments and, therefore, our future earnings and cash flows, assuming other factors are held constant. Our revenues, results of operations and cash flows are also affected by market prices for commodities such as crude oil. Commodity prices generally are affected by a wide range of factors beyond our control, including weather, disease, insect damage, drought, the availability and adequacy of supply, government regulation and policies and general political and economic conditions. At any time, our inventory levels and unfulfilled fixed or partially fixed price contract obligations may be substantial. We have processes in place to monitor exposures to these risks and engage in strategies to manage these risks. If these controls and strategies are not successful in mitigating our exposure to these fluctuations, we could be materially and adversely affected. Increases in market prices for commodities that we purchase without a corresponding increase in the price of our products or our sales volume or a decrease in our other operating expenses could reduce our revenues and net income. Significant increases in raw material and labor costs could increase our operating costs significantly and harm our profitability. in pricing, which could have a material adverse effect on our business, results of operations and financial condition. Third parties may fail to manufacture or provide necessary components for our products properly or in a timely manner. We are often dependent on third parties to manufacture or supply components for our products. We typically do not enter into long-term contracts with third-party suppliers. We may experience supply problems as a result of financial or operating difficulties or the failure or consolidation of our suppliers. We may also experience supply problems as a result of shortages and discontinuations resulting from product obsolescence or other shortages or allocations by suppliers. Unfavorable economic conditions may also adversely affect our suppliers or the terms on which we purchase products. In the future, we may not be able to negotiate arrangements with third parties to secure products that we require in sufficient quantities or on reasonable terms. If we cannot negotiate arrangements with third parties to produce our products or if the third parties fail to produce our products to our specifications or in a timely manner, our business, results of operations and financial condition may be materially adversely affected. We are subject to risks associated with labor relations, labor costs and labor disruptions. We are subject to the costs and risks generally associated with labor disputes and organizing activities related to unionized labor. From time to time, our operations may be disrupted by strikes, public demonstrations or other coordinated actions and publicity. We may incur increased legal costs and indirect labor costs as a result of contractual disputes, negotiations or other labor-related disruptions. Operations where we have collective bargaining agreements with employees accounted for approximately 2% of our employees as of December 31, 2017. These operations may be more highly affected by labor force activities than others, and all collective bargaining agreements must be renegotiated annually. Other locations may also face organizing activities or effects. Labor organizing activities could result in additional employees becoming unionized. Furthermore, collective bargaining agreements may limit our ability to reduce the size of workforces during an economic downturn, which could put us at a competitive disadvantage. Failure to retain key personnel could impede our ability to execute our business plan and growth strategy. One of the most important factors in our ability to profitably execute our business plan is our ability to attract, develop and retain qualified personnel. Many of our key executives, managers and employees have knowledge and an understanding of our business and our industry that cannot be readily duplicated and they are the key individuals that interface with customers. In addition, the ability to attract and retain qualified personnel is dependent on the availability of qualified personnel, the impact on the labor supply due to general economic conditions and the ability to provide a competitive compensation package. Failure to retain key personnel may materially adversely affect our business, results of operations and financial condition. In addition, labor shortages, the inability to hire or retain qualified employees nationally, regionally or locally or increased labor costs could have a material adverse effect on our ability to control expenses and efficiently conduct our operations. We may not be able to continue to hire and retain the sufficiently skilled labor force necessary to operate efficiently and to support our operating strategies. Labor expenses could also increase as a result of continuing shortages in the supply of personnel. If we determine that our goodwill and intangible assets have become impaired, we may incur impairment charges, which would negatively impact our operating results. We have goodwill, which represents the excess of the total purchase price of our acquisitions over the fair value of the assets acquired, and other intangible assets. As of December 31, 2017, we had approximately $28.6 million and $126.3 million of goodwill and intangible assets, net, respectively, in our statement of financial position, which would represent approximately 2.0% and 9.0% of total assets, respectively. We are required to review goodwill and intangible assets at least annually for impairment. In the event impairment is identified, a charge to earnings would be recorded. Impairment may result from significant changes in the manner of use of the acquired asset, negative industry or economic trends and significant underperformance relative to historic or projected operating results. We recorded impairment charges of $60.7 million in 2017. These charges represent non-cash impairment charges of certain of our operations recognized in connection with our annual goodwill and intangible asset impairment testing. Any additional impairment charges in the future could adversely affect our business, results of operations and financial condition. We are subject to various laws and regulations including those governing government contracts, corruption and the environment. Obligations and liabilities under these laws and regulations may materially harm our business. revenue which would harm our business, results of operations and financial condition. We are not aware of any action contemplated by any regulatory authority related to any possible non-compliance by or in connection with our operations. Our operations are subject to an array of governmental regulations in each of the jurisdictions in which we operate. For example, our activities in the United States are subject to regulation by several federal and state government agencies, including the Occupational Safety and Health Administration and by federal and state laws. Our operations and activities in other jurisdictions are subject to similar governmental regulations. Similar to conventionally constructed buildings, the modular business industry is also subject to regulations by multiple governmental agencies in each jurisdiction relating to, among others, environmental, zoning and building standards, and health, safety and transportation matters. Noncompliance with applicable regulations, implementation of new regulations or modifications to existing regulations may increase costs of compliance, require a termination of certain activities or otherwise have a material adverse effect on our business, results of operations and financial condition. Our government customers include the US government, which means we are subject to various statutes and regulations applicable to doing business with the US government. These types of contracts customarily contain provisions that give the US government substantial rights and remedies, many of which are not typically found in commercial contracts and which are unfavorable to contractors, including provisions that allow the government to unilaterally terminate or modify our federal government contracts, in whole or in part, at the government’s convenience. Under general principles of US government contracting law, if the government terminates a contract for convenience, the terminated company may generally recover only its incurred or committed costs and settlement expenses and profit on work completed prior to the termination. If the government terminates a contract for default, the defaulting company may be liable for any extra costs incurred by the government in procuring undelivered items from another source. mandatory socioeconomic compliance requirements, including labor requirements, non-discrimination and affirmative action programs and environmental compliance requirements. If we fail to maintain compliance with these requirements, our contracts may be subject to termination, and we may be subject to financial and/or other liability under our contracts or under the Federal Civil False Claims Act (the “False Claims Act”). The False Claims Act’s “whistleblower” provisions allow private individuals, including present and former employees, to sue on behalf of the US government. The False Claims Act statute provides for treble damages and other penalties and, if our operations are found to be in violation of the False Claims Act, we could face other adverse action, including suspension or prohibition from doing business with the United States government. Any penalties, damages, fines, suspension or damages could adversely affect our ability to operate our business and our financial results. We are subject to various anti-corruption laws that prohibit improper payments or offers of payments to foreign governments and their officials by a US person for the purpose of obtaining or retaining business. We operate in countries that may present a more corruptible business environment than the United States. Such activities create the risk of unauthorized payments or offers of payments by one of our employees or agents that could be in violation of various laws, including the FCPA. We have implemented safeguards and policies to discourage these practices by our employees and agents. However, existing safeguards and any future improvements may prove to be ineffective and employees or agents may engage in conduct for which we might be held responsible. If employees violate our policies or we fail to maintain adequate record-keeping and internal accounting practices to accurately record our transactions we may be subject to regulatory sanctions. Violations of the FCPA or other anti-corruption laws may result in severe criminal or civil sanctions and penalties, including suspension or debarment from US government contracting, and we may be subject to other liabilities which could have a material adverse effect on our business, results of operations and financial condition. We are also subject to similar anti-corruption laws in other jurisdictions. time, our operations or conditions on properties that we have acquired have resulted in liabilities under these environmental laws. We may in the future incur material costs to comply with environmental laws or sustain material liabilities from claims concerning noncompliance or contamination. We have no reserves for any such liabilities. We cannot predict what environmental legislation or regulations will be enacted in the future, how existing or future laws or regulations will be administered or interpreted, or what environmental conditions may be found to exist at our facilities or at third party sites for which we may be liable. Enactment of stricter laws or regulations, stricter interpretations of existing laws and regulations or the requirement to undertake the investigation or remediation of currently unknown environmental contamination at sites we own or third party sites may require us to make additional expenditures, some of which could be material. We may be subject to litigation, judgments, orders or regulatory proceedings that could materially harm our business. We are subject to claims arising from disputes with customers, employees, vendors and other third parties in the normal course of business. The risks associated with any such disputes may be difficult to assess or quantify and their existence and magnitude may remain unknown for substantial periods of time. If the plaintiffs in any suits against us were to successfully prosecute their claims, or if we were to settle such suits by making significant payments to the plaintiffs, our business, results of operations and financial condition would be harmed. Even if the outcome of a claim proves favorable to us, litigation can be time consuming and costly and may divert management resources. To the extent that our senior executives are named in such lawsuits, our indemnification obligations could magnify the costs. Any failure of our management information systems could disrupt our business and result in decreased lease or sale revenue and increase overhead costs. We depend on our management information systems to actively manage our lease fleet, control new unit capital spending and provide fleet information, including leasing history, condition and availability of our units. These functions enhance our ability to optimize lease fleet utilization, rentability and redeployment. The failure of our management information systems to perform as anticipated could damage our reputation with our customers, disrupt our business or result in, among other things, decreased lease and sales revenue and increased overhead costs. For example, an inaccurate utilization rate could cause us to fail to have sufficient inventory to meet consumer demand, resulting in decreased sales. Any such failure could harm our business, results of operations and financial condition. In addition, the delay or failure to implement information system upgrades and new systems effectively could disrupt our business, distract management’s focus and attention from business operations and growth initiatives and increase our implementation and operating costs, any of which could materially adversely affect our operations and operating results. Like other companies, our information systems may be vulnerable to a variety of interruptions due to events beyond our control, including, but not limited to, telecommunications failures, computer viruses, security breaches (including cyber-attacks) and other security issues. In addition, because our systems contain information about individuals and businesses, the failure to maintain the security of the data we hold, whether the result of our own error or the malfeasance or errors of others, could harm our reputation or give rise to legal liabilities leading to lower revenue, increased costs, regulatory sanctions and other potential material adverse effects on our business, results of operations and financial condition. Our operations could be subject to natural disasters and other business disruptions, which could materially adversely affect our future revenue and financial condition and increase our costs and expenses. Our operations could be subject to natural disasters and other business disruptions such as fires, floods, hurricanes, earthquakes and terrorism, which could adversely affect our future revenue and financial condition and increase our costs and expenses. For example, hurricanes Harvey and Irma in August and September 2017 impacted our operations in Texas and Florida. We have submitted claims relating to these hurricanes to our insurers in the impacted locations, however, we may face significant delays in resolving our insurance claims or our insurers may challenge or deny parts or all of our claims. See “Risk Factors-Risks Relating Our Business - We are exposed to various possible claims relating to our business and our insurance may not fully protect us.” See “Management’s Discussion and Analysis of Financial Condition and Results of Operations-Factors Affecting Our Business-Natural Disasters.” In addition, the occurrence and threat of terrorist attacks may directly or indirectly affect economic conditions, which could in turn adversely affect demand for our products and services. In the event of a major natural or man-made disaster, we could experience loss of life of our employees, destruction of facilities or business interruptions, any of which may materially adversely affect our business. If any of our facilities or a significant amount of our rental equipment were to experience a catastrophic loss, it could disrupt our operations, delay orders, shipments and revenue recognition and result in expenses to repair or replace the damaged rental equipment and facility not covered by asset, liability, business continuity or other insurance contracts. Also, we could face significant increases in premiums or losses of coverage due to the loss experienced during and associated with these and potential future natural or man-made disasters that may materially adversely affect our business. In addition, attacks or armed conflicts that directly impact one or more of our properties could significantly affect our ability to operate those properties and thereby impair our results of operations. More generally, any of these events could cause consumer confidence and spending to decrease or result in increased volatility in the global economy and worldwide financial markets. Any of these occurrences could have a material adverse effect on our business, results of operations and financial condition. We are exposed to various possible claims relating to our business and our insurance may not fully protect us. We are exposed to various possible claims relating to our business. These possible claims include those relating to: (1) personal injury or death caused by containers, offices or trailers rented or sold by us; (2) motor vehicle accidents involving our vehicles and our employees; (3) employment-related claims; (4) property damage and (5) commercial claims. Our insurance policies have deductibles or self-insured retentions which would require us to expend amounts prior to taking advantage of coverage limits. We believe that we have adequate insurance coverage for the protection of our assets and operations. However, our insurance may not fully protect us for certain types of claims such as dishonest, fraudulent, criminal or malicious acts; terrorism, war, hostile or warlike action during a time of peace; automobile physical damage; natural disasters; and cybercrime. Demand for our products and services is sensitive to changes in demand within a number of key industry end-markets and geographic regions. Our financial performance is dependent on the level of demand for our products and services, which is sensitive to the level of demand within various sectors, in particular, the commercial and industrial, construction, education, energy and natural resources, government and other end-markets. Each of these sectors is influenced not only by the state of the general global economy, but by a number of more specific factors as well. For example, demand for modular buildings within the energy and resources sector may be materially adversely affected by a decline in global energy prices. Demand for our products and services may also vary among different localities or regions. The levels of activity in these sectors and geographic regions may also be cyclical, and we may not be able to predict the timing, extent or duration of the activity cycles in the markets in which we or our key customers operate. A decline or slowed growth in any of these sectors or geographic regions could result in reduced demand for its products and services, which may materially adversely affect our business, results of operations and financial condition. We may not be able to redeploy our units effectively should a significant number of our leased units be returned during a short period of time, which could adversely affect our financial performance. While our typical lease terms include contractual provisions requiring customers to retain units on lease for a specified period, our customers generally rent their units for periods longer than the contractual lease terms. As of December 31, 2017, the average lease duration of our current lease portfolio is approximately 32 months. Should a significant number of leased units be returned during a short period of time, a large supply of units would need to be remarketed. Our failure to effectively remarket a large influx of units returning from leases could have a material adverse effect on our financial performance. Failure to close our unit sales transactions as projected could cause our actual revenue or cash flow for a particular fiscal period to differ from expectations. Sales of new and used modular space and portable storage units to customers represented approximately 13.1% of our revenue during the year ended December 31, 2017. The completion of sale transactions is subject to certain factors that are beyond our control, including permit requirements and weather conditions. Accordingly, the actual timing of the completion of these transactions may take longer than expected. As a result, our actual revenue and cash flow in a particular fiscal period may not consistently correlate to our internal operational plans and budgets. If we are unable to prepare accurate internal operational plans and budgets, we may fail to take advantage of business and growth opportunities otherwise available and our business, results of operations and financial condition may be materially adversely affected. Our principal stockholder has substantial control over our business, which may be disadvantageous to other stockholders. Sapphire, controlled by TDR Capital, beneficially owned approximately 54.8% of our outstanding shares of Class A common stock and 100% of our outstanding Class B common stock as of March 1, 2018. In addition, TDR Capital nominated two directors to serve on our board of directors and maintains a director nomination right, based on its share ownership. As a result of its ability to control a significant percentage of the voting power of our outstanding common stock, TDR Capital may have substantial control over matters requiring approval by our stockholders, including the election and removal of directors, amendments to our certificate of incorporation and bylaws, any proposed merger, consolidation or sale of all or substantially all of our assets and other corporate transactions. TDR Capital may have interests that are different from those of other stockholders. Our business has not been managed as a public company since 2007 and our resources may be insufficient for a public company. equity securities may trade and the continuous scrutiny of securities analysts and investors. These new obligations and constituents will require significant attention from our senior management and could divert their attention away from the day-to-day management of the business, which could adversely affect our business, financial condition and operating results. Our business could be adversely affected if our internal infrastructure is inadequate, if we are unable to engage outside consultants or if we are otherwise unable to fulfill our public company obligations. If we fail to maintain an effective system of internal controls, we may not be able to accurately report our financial results, which could lead to a loss of investor confidence in our financial statements and have an adverse effect on our stock price. Effective internal controls are necessary for us to provide reliable and accurate financial statements and to effectively prevent fraud. We devote significant resources and time to comply with the internal control over financial reporting requirements of Sarbanes Oxley. As described in Part II Item 9A. “Controls and Procedures,” we have concluded that our disclosure controls and procedures were not effective as of December 31, 2017 due to material weaknesses in our internal controls over financial reporting associated with accounting for income taxes and reverse acquisition accounting. We will enhance, and continue to enhance, our internal controls and expect to remediate these control deficiencies. However, we cannot be certain that these measures will be successful or that we will be able to prevent future material weaknesses or significant deficiencies. Inadequate internal controls could cause investors to lose confidence in our reported financial information, which could have a negative effect on investor confidence in our financial statements, the trading price of our stock and our access to capital. We incur significantly increased costs as a result of operating as a public company, and our management is required to devote substantial time to compliance efforts. We incur significant legal, accounting, insurance and other expenses as a result of being a public company. The Dodd-Frank Wall Street Reform and Consumer Protection Act of 2010, as amended (the “Dodd-Frank Act”) and the Sarbanes-Oxley Act of 2002 as amended (the “Sarbanes-Oxley Act”), as well as related rules implemented by the SEC, have required changes in corporate governance practices of public companies. In addition, rules that the SEC is implementing or is required to implement pursuant to the Dodd-Frank Act are expected to require additional change. We expect that ongoing compliance with these and other similar laws, rules and regulations, including compliance with Section 404 of the Sarbanes-Oxley Act, will substantially increase our expenses, including legal and accounting costs, and make some activities more time-consuming and costly. It is possible that these expenses will exceed the increases projected by management. These laws, rules and regulations may also make it more expensive to obtain director and officer liability insurance, and it may be required to accept reduced policy limits and coverage or incur substantially higher costs to obtain the same or similar coverage, which may make it more difficult for us to attract and retain qualified persons to serve on its board of directors or as officers. Although the Jumpstart Our Business Startups Act of 2012, as amended (the “JOBS Act”) may, for a limited period of time, somewhat lessen the cost of complying with these additional regulatory and other requirements, we nonetheless expect a substantial increase in legal, accounting, insurance and certain other expenses in the future, which will negatively impact its results of operations and financial condition. Global capital and credit market conditions could materially and adversely affect our ability to access the capital and credit markets or the ability of key counterparties to perform their obligations to us. Although we believe the banks participating in the ABL Facility have adequate capital and resources, we can provide no assurance that all of those banks will continue to operate as a going concern in the future. If any of the banks in our lending group were to fail, it is possible that the borrowing capacity under the ABL Facility would be reduced. Practical, legal and tax limitations may also limit our ability to access and service the working capital needs of other businesses in the WSII subsidiary group. In the event that the availability under the ABL Facility were reduced significantly, we could be required to obtain capital from alternate sources in order to finance our capital needs. The options for addressing such capital constraints would include, but would not be limited to, obtaining commitments from the remaining banks in the lending group or from new banks to fund increased amounts under the terms of the ABL Facility, and accessing the public capital markets. In addition, we may delay certain capital expenditures to ensure that we maintain appropriate levels of liquidity. If it became necessary to access additional capital, any such alternatives could have terms less favorable than those terms under the ABL Facility, which could have a material adverse effect on our business, results of operations, financial condition and cash flows. In addition, in the future we may need to raise additional funds to, among other things, refinance existing indebtedness, fund existing operations, improve or expand its operations, respond to competitive pressures or make acquisitions. If adequate funds are not available on acceptable terms, we may be unable to achieve our business or strategic objectives or compete effectively. Our ability to pursue certain future opportunities may depend in part on our ongoing access to debt and equity capital markets. We cannot assure you that any such financing will be available on terms satisfactory to us or at all. If we are unable to obtain financing on acceptable terms, we may have to curtail our growth by, among other things, curtailing the expansion of our fleet of units or our acquisition strategy. to counterparty and may be insufficient for us to adequately interpret or evaluate our exposure and/or determine appropriate or timely responses. Our leverage may make it difficult for us to service our debt and operate our business. As of December 31, 2017, we had $650.5 million of total indebtedness, excluding deferred financing fees, consisting primarily of $310.0 million of borrowings under the ABL Facility, $300.0 million of Notes and $40.5 million of other financing obligations. limiting, among other things, our ability to borrow additional funds or raise equity capital in the future and increasing the costs of such additional financings. Our ability to meet our debt service obligations, including those under the ABL Facility and the Notes, or to refinance our debt depends on our future operating and financial performance, which will be affected by our ability to successfully implement our business strategy as well as general economic, financial, competitive, regulatory and other factors beyond our control. If our business does not generate sufficient cash flow from operations, or if future borrowings are not available to us in an amount sufficient to enable us to pay our indebtedness or to fund our other liquidity needs, we may need to refinance all or a portion of our indebtedness on or before the maturity thereof, sell assets, reduce or delay capital investments or seek to raise additional capital, any of which could have a material adverse effect on our operations. In addition, we may not be able to affect any of these actions, if necessary, on commercially reasonable terms or at all. Any refinancing of our debt could be at higher interest rates and may require us to comply with more onerous covenants, which could further restrict our business operations. The terms of our existing or future debt instruments may limit or prevent us from taking any of these actions. If we default on the payments required under the terms of certain of our indebtedness, that indebtedness, together with debt incurred pursuant to other debt agreements or instruments that contain cross-default or cross-acceleration provisions, may become payable on demand, and we may not have sufficient funds to repay all of our debts. As a result, our inability to generate sufficient cash flow to satisfy our debt service obligations, or to refinance or restructure our obligations on commercially reasonable terms or at all, would have an adverse effect, which could be material, on our business, financial condition and results of operations, as well as on our ability to satisfy our debt obligations. Despite our current level of indebtedness, we and our subsidiaries will still be able to incur significant additional amounts of debt, which could further exacerbate the risks associated with our substantial indebtedness. We and our subsidiaries may be able to incur substantial additional debt in the future. As of December 31, 2017, WSII and the guarantors of the Notes and the ABL Facility had up to $281.1 million available for borrowing under the ABL Facility including letters of credit, subject to borrowing base availability. Although the indenture that governs the Notes (the “Indenture”) and the credit agreement that governs the ABL Facility contain restrictions on the incurrence of additional debt, these restrictions are subject to a number of significant qualifications and exceptions, and under certain circumstances, the amount of debt that could be incurred in compliance with these restrictions could be substantial. In addition, the Indenture and the credit agreement that governs the ABL Facility do not prevent us from incurring other obligations that do not constitute indebtedness under those agreements. If new debt is added to our and our subsidiaries’ existing debt levels, the risks associated with our substantial indebtedness described above, including our possible inability to service our debt, will increase. We are subject to and may, in the future become subject to, covenants that limit our operating and financial flexibility and, if we default under our debt covenants, we may not be able to meet our payment obligations. issue or sell share capital of certain subsidiaries. Although these limitations are subject to significant exceptions and qualifications, these covenants could limit our ability to finance future operations and capital needs and our ability to pursue acquisitions and other business activities that may be in our interest. Our subsidiaries’ ability to comply with these covenants and restrictions may be affected by events beyond our control. These include prevailing economic, financial and industry conditions. If any of our subsidiaries default on their obligations under the ABL Facility and the Indenture, then the relevant lenders or holders could elect to declare the debt, together with accrued and unpaid interest and other fees, if any, immediately due and payable and proceed against any collateral securing that debt. If the debt under the ABL Facility, the Indenture or any other material financing arrangement that we enter into were to be accelerated, our assets may be insufficient to repay in full the ABL Facility, the Notes and our other debt. The ABL Facility also requires our subsidiaries to satisfy specified financial maintenance tests in the event certain excess liquidity requirements are not satisfied. The ability to meet these tests could be affected by deterioration in our operating results, as well as by events beyond our control, including increases in raw materials prices and unfavorable economic conditions, and we cannot assure that these tests will be met. If an event of default occurs under the ABL Facility, the lenders could terminate their commitments and declare all amounts borrowed, together with accrued and unpaid interest and other fees, to be immediately due and payable. Borrowings under other debt instruments that contain cross-acceleration or cross-default provisions also may be accelerated or become payable on demand. In these circumstances, our assets may not be sufficient to repay in full that indebtedness and our other indebtedness then outstanding. The amount of borrowings permitted at any time under the ABL Facility is subject to compliance with limits based on a periodic borrowing base valuation of the collateral thereunder. As a result, our access to credit under the ABL Facility is subject to significant fluctuations depending on the value of the borrowing base of eligible assets as of any measurement date, as well as certain discretionary rights of the agent in respect of the calculation of such borrowing base value. As a result of any change in valuation, the availability under the ABL Facility may be reduced, or we may be required to make a repayment of the ABL Facility, which may be significant. The inability to borrow under the ABL Facility or the use of available cash to repay the ABL Facility as a result of a valuation change may adversely affect our liquidity, results of operations and financial position. If our warrants are exercised, the number of shares eligible for future resale in the public market would increase and result in dilution to our shareholders. We have 50,000,000 outstanding public warrants exercisable for 25,000,000 shares of Class A common stock at an exercise price of $11.50 per whole share. In addition, there are 19,500,000 private warrants outstanding exercisable for 9,750,000 shares of Class A common stock at an exercise price of $11.50 per whole share. To the extent warrants are exercised, additional Class A shares will be issued, which will result in dilution to the holders of our common stock and increase the number of shares eligible for resale in the public market. Sales of substantial numbers of such shares in the public market could adversely affect the market price of our Class A common stock. Shares held by certain significant shareholders are subject to transfer and voting restrictions under an earnout agreement. Upon release, significant sales of such shares could have a negative impact on the trading price of our stock. Sales of substantial amounts of our Class A common stock in the public market, or the perception that such sales could occur, could adversely affect the market price of our Class A common stock and could materially impair our future ability to raise capital through offerings of common stock or other equity securities. We have 84,644,774 shares of Class A common stock outstanding. Our former sponsor, Double Eagle Acquisition LLC (“DEAL”) and Harry E. Sloan (collectively, the “Founders”) have deposited 12,425,000 shares of Class A common stock into escrow for a period of three years, subject to early release, pursuant to an earnout agreement entered into at the closing of the Business Combination. In addition, the Founders and our former independent directors (the “Initial Shareholders”) have agreed not to transfer, assign or sell any of their shares of Class A common stock until the first anniversary of the closing date of the Business Combination or earlier if, subsequent to our Business Combination, (i) the last sale price of our Class A common stock equals or exceeds $12.50 per share for any 20 trading days within any 30-trading day period commencing at least 150 days after our Business Combination, or (ii) we consummate a subsequent merger, stock exchange or other similar transaction which results in all of our stockholders having the right to exchange their shares of Class A common stock for cash, securities or other property. However, assuming such shares are released in accordance with the earnout agreement, following the termination of these transfer restrictions, we cannot predict what effect, if any, market sales of common stock held by our initial shareholders or any other shareholder or the availability of these shares for future sale will have on the market price of our Class A common stock. Pursuant to the terms of the Earnout Agreement, a release of 6,212,500 shares of Class A common stock from escrow was triggered on January 19, 2018 by the closing price of the Class A shares exceeding $12.50 per share for 20 out of 30 days. We are an “emerging growth company” and as a result of the reduced disclosure and governance requirements applicable to emerging growth companies, our common stock may be less attractive to investors. We are an “emerging growth company” as defined in the JOBS Act, and we intend to utilize some of the exemptions from reporting requirements that are applicable to other public companies that are not emerging growth companies, including not being required to comply with the auditor attestation requirements of Section 404 of the Sarbanes-Oxley Act, reduced disclosure obligations regarding executive compensation in our periodic reports and proxy statements, and adopting new accounting standards using private company effective dates. We cannot predict if investors will find our common stock less attractive because we will rely on these exemptions. If some investors find our common stock less attractive as a result, there may be a less active trading market for our common stock and our stock price may be more volatile. We may take advantage of these reporting exemptions until we are no longer an emerging growth company. We will remain an emerging growth company until the earlier of (1) the last day of the fiscal year (a) following the fifth anniversary of the completion of our initial public offering, (b) in which we have total annual gross revenue of at least $1.0 billion, or (c) in which we are deemed to be a large accelerated filer, which means the market value of our common stock that is held by non-affiliates exceeds $700 million as of the prior June 30th, and (2) the date on which we have issued more than $1.0 billion in non-convertible debt during the prior three-year period. Our corporate headquarters are located in Baltimore, Maryland. Our executive, financial, accounting, legal, administrative, management information systems and human resources functions operate from this single, leased office. We operate over 100 branch locations across the United States, Canada and Mexico. Collectively, we lease approximately 80% of our branch properties and own the remaining balance. Our management believes that none of our properties, on an individual basis, are material to our operations, and we also believe that satisfactory alternative properties could be found in all of our markets if ever necessary. Subject to certain exceptions, substantially all of our owned real and personal property in the United States and Canada is encumbered under our ABL Facility and Notes. We do not believe that the encumbrances will materially detract from the value of our properties, nor will they materially interfere with their use in the operation of our business. We are involved in various lawsuits, claims and legal proceedings that arise in the ordinary course of business. These matters involve, among other things, disputes with vendors or customers, personnel and employment matters, and personal injury. We assess these matters on a case-by-case basis as they arise and establish reserves as required. As of December 31, 2017, there was no material pending legal proceedings in which we or any of our subsidiaries are a party or to which any of our property is subject. Our Class A common stock and warrants are listed on the Nasdaq Capital Market under the symbols “WSC” and “WSCWW,” respectively. Through November 29, 2017, our common stock, warrants, and units were quoted under the symbols “EAGL,” “EAGLW” and “EAGLU,” respectively. Upon consummation of the Business Combination, our public units automatically separated into their component securities and, as a result, no longer trade as a separate security. These units were delisted from Nasdaq. The following table includes the high and low closing prices for shares of our Class A common stock and warrants for the periods presented. Share prices for the fourth quarter of 2017 represent prices for Class A common shares of WillScot Corporation which came into existence on November 29, 2017 as part of the Business Combination. Share prices for all other periods presented represent prices for Class A ordinary shares of Double Eagle Acquisition Corp (“Double Eagle”). As of December 31, 2017, there were eight holders of record of our Class A common stock, one holder of record of our Class B common stock and nine holders of record of our warrants. The number of holders of record does not include a substantially greater number of “street name” holders or beneficial holders whose Class A common stock or warrants are held of record by banks, brokers and other financial institutions. We have not paid any cash dividends on our common stock to date. The payment of cash dividends will be dependent upon our revenues and earnings, if any, capital requirements and general financial condition. The determination of whether or not we pay any cash dividends from time to time is within the discretion of our board of directors. Further, our ability to declare dividends may be limited by restrictive covenants under our financing arrangements. On February 5, 2018, we filed a registration statement on Form S-8, registering 4,000,000 shares of Class A common stock, relating to awards to be undertaken in the future, with such vesting conditions, as applicable, to be determined in accordance with the WillScot Corporation 2017 Incentive Award Plan (the “Plan”). The following types of awards can be issued under the Plan: stock options, stock appreciation rights, restricted stock, restricted stock units, performance compensation awards and other stock-based awards. last sale price of our Class A common stock is at least $18.00 per share on each of 20 trading days within a 30 trading day period ending on the third business day prior to the date on which notice of the redemption is given. The private placement warrants, however, are nonredeemable so long as they are held by the initial holders or their permitted transferees. On January 2, 2018, we received a notice from Nasdaq’s Listings Qualification Department indicating that the our warrants do not comply with Nasdaq’s 400 round lot holder requirement for initial listing. We requested more time to satisfy the minimum holder requirement and, on February 20, 2018, we were notified that our request was granted. Our warrants will be delisted if they do not satisfy the minimum round lot holder requirement on or before July 3, 2018. The following stock price performance graph should not be deemed incorporated by reference by any general statement incorporating by reference this Annual Report on Form 10-K into any filing under the Exchange Act or the Securities Act, except to the extent that we specifically incorporate this information by reference, and shall not otherwise be deemed filed under such acts. 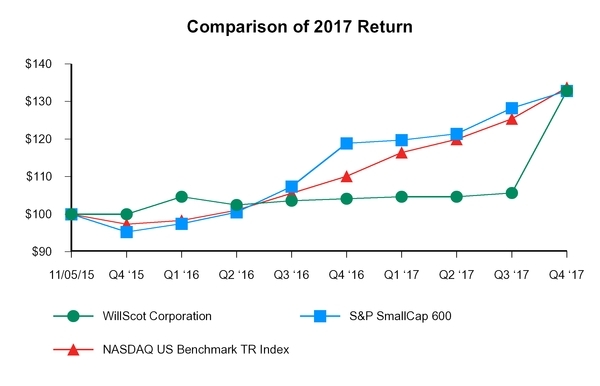 The graph below compares the cumulative total return of our Class A common stock from November 5, 2015, through December 31, 2017, with the comparable cumulative return of two indices, the Standard and Poor’s (“S&P”) SmallCap 600 Index and the Nasdaq US Benchmark TR Index. The graph plots the growth in value of an initial investment in each of our Class A ordinary shares, the S&P SmallCap 600 Index and the Nasdaq US Benchmark Index over the indicated time periods, and assumes reinvestment of all dividends, if any, paid on the securities. We have not paid any cash dividends and, therefore, the cumulative total return calculation for us is based solely upon share price appreciation and not upon reinvestment of cash dividends. The share price performance shown on the graph is not necessarily indicative of future price performance. On November 29, 2017, in connection with the closing of the Business Combination, we entered into a subscription agreement with Sapphire under which Sapphire purchased 43,568,901 shares of our Class A common stock, par value $0.0001 per share, at a price of $9.60 per share, for a total purchase price of $418.3 million. Under the subscription agreement, Sapphire is restricted from transferring any shares acquired under the subscription agreement and beneficially owned by Sapphire prior to May 29, 2018, subject to limited exceptions. The shares of common stock issued pursuant to the subscription agreement are “restricted securities” under applicable federal securities laws. The shares are also subject to a registration rights agreement that provides for certain demand, shelf and piggyback registration rights. The proceeds from the Private Placement, together with other funding, were used by the Company to effectuate the transactions comprising the Business Combination. The table below is intended to help investors better understand (i) how the number of Class A shares outstanding under GAAP may differ from the actual number of Class A shares issued and outstanding at specific points in time, and (ii) the potential impact, dilutive or otherwise, of certain events or transactions on our existing shareholders. Due to the fact that our predecessor was a special purpose acquisition company and to illustrate the impact of certain of the arrangements implemented in connection with our Business Combination, management believes that the information below will help investors better understand our capital structure and the risks associated with investing in our securities. This information is provided solely for illustrative purposes, and speaks only as of the date(s) indicated. We can provide no assurances if or when any future events or transactions may occur that would result in a change in the number of shares of our Class A common stock outstanding. (a) Excluded from the US GAAP basic outstanding share counts are 12,425,000 Class A shares ("Founder Shares") issued and outstanding that have been deposited into an escrow account that have no voting or economic rights while in escrow. 6,337,500 and 6,087,500 of the Founder Shares were deposited by DEAL and Harry Sloan, respectively, pursuant to an earnout agreement. See further information on the earnout agreement in Note 2 to the Financial Statements. (b) On January 19, 2018, 6,212,500 of Founder Shares were released from the escrow account to TDR Capital (3,106,250 shares) and the Founders (3,106,250 shares). The remaining escrowed shares will be released to the Founders and TDR Capital if or when the average trading price of our Class A shares equals or exceeds $15.00 per share for 20 out of 30 trading days. (c) Includes 14,550,000 warrants owned by the Founders (7,275,000 warrants owned by each of DEAL and Harry Sloan) as of March 1, 2018, that are restricted under an earnout agreement until the earlier of (i) November 29, 2019 or (ii) our consummation of certain qualifying acquisitions. If the restrictions lapse due to the completion of a qualifying acquisition, then 1/3 of the warrants will be transferred to TDR Capital and the remaining 2/3 will remain with the Founders. (d) Assumes an exchange by TDR Capital of 8,024,419 common shares of Williams Scotsman Holdings Corp. into an equal number of Class A shares of WSC under an exchange agreement, and the corresponding redemption of an equal number of Class B shares of WSC. See further information on the exchange agreement in Note 2 to the Financial Statements. (e) Includes 30,000 shares owned by Jeff Saganksy, a WSC director who is deemed to have beneficial ownership over the shares owned by DEAL as of March 1, 2018. (f) Includes Gerry Holthaus (300,000 Class A shares), Fred Rosen (25,000 Class A shares and 1,650,000 warrants), and two former directors (50,000 A shares and 3,300,000 warrants), as of March 1, 2018. (g) Total outstanding Class A shares in the “Other Shares and Equivalents Outstanding” columns represent the cumulative amount of outstanding Class A shares if each of the potential events in items b, c and d were to occur in the order presented above. On November 29, 2017, our company, formerly known as Double Eagle, indirectly acquired WSII through the Business Combination. The Business Combination was accounted for as a reverse acquisition in which WSII was the accounting acquirer. Except as otherwise provided herein, our financial statement presentation includes (i) the results of WSII and its subsidiaries as our accounting predecessor for periods prior to the completion of the Business Combination, and (ii) the results of WillScot Corporation (including the consolidation of WSII and its subsidiaries) for periods after the completion of the Business Combination. The operating statistics and data contained herein represents the operating information of WSII’s business. The following selected historical financial information should be read together with the consolidated financial statements and accompanying notes and “Management’s Discussion and Analysis of Financial Condition and Results of Operations.” The selected historical financial information in this section is not intended to replace WSC’s consolidated financial statements and the related notes. The Company presents Adjusted EBITDA, Adjusted EBITDA less Net CAPEX, Adjusted Gross Profit and Net Capital Expenditures for Rental Equipment, measurements not calculated in accordance with accounting principles generally accepted in the US, (“GAAP”), because they are key metrics used by management to assess financial performance. Our business is capital-intensive and these additional metrics allow management to further evaluate its operating performance. See below for a reconciliation of non-GAAP financial measures. Included in corporate & other are selling, general and administrative costs related to the Algeco Group's corporate costs incurred prior to or as part of the Business Combination which are not anticipated to be part of the ongoing costs of WSC. The Company makes capital expenditures (“CAPEX”) for purchases and capitalized refurbishments of rental equipment and property, plant and equipment. The following presents definitions and reconciliations to the nearest comparable GAAP measure of certain WSC and its operating segments’ non-GAAP financial measures used in this Annual Report on Form 10-K.
Change in fair value of contingent consideration related to non-cash changes in fair value of an acquisition related earnout agreement. Other expense includes consulting expenses related to certain one-time projects, financing costs not classified as interest expense, gains and losses on disposals of property, plant, and equipment, and non-cash charges for WSII’s share-based compensation plans. Other expense represents primarily acquisition-related costs such as advisory, legal, valuation and other professional fees in connection with actual or potential business combinations, which are expensed as incurred, but do not reflect ongoing costs of the business. We define Adjusted EBITDA less Net CAPEX as Adjusted EBITDA less the gross profit on sale of rental units, less Net Capital Expenditures for Rental Equipment. Adjusted EBITDA less Net CAPEX is not a measurement of our financial performance under GAAP and should not be considered as an alternative to net income (loss) or other performance measure derived in accordance with GAAP. In addition, our measurement of Adjusted EBITDA less Net CAPEX may not be comparable to similarly titled measures of other companies. Our management believes that the presentation of Adjusted EBITDA less Net CAPEX provides useful information to investors regarding our results of operations because it assists in analyzing the performance of our business.